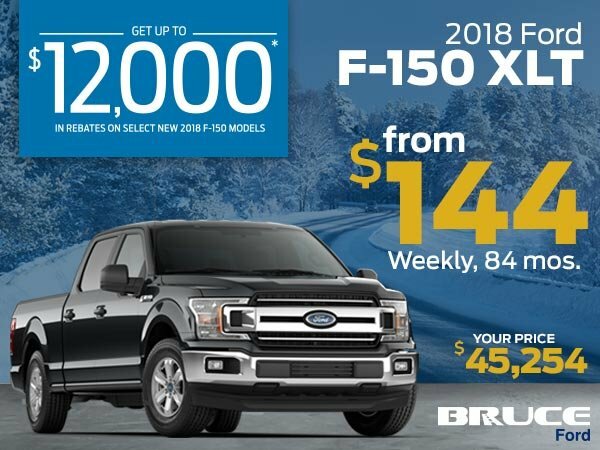 Up To $12,000 in Rebates on Select New 2018 F-150 Models this Month at Bruce Ford. Our featured F-150 is a 2018 XLT Crew Cab with 6.5' Box. This truck is custom built for maximum towing performance. Finance from $144** Weekly over 84 Months. Do you have a Trade-In? You could qualify for ADDITIONAL SAVINGS with our Trade-In Bonus Program! Make this your next work truck - get started by booking your Test Drive today! *Plus taxes and fees. **On approved credit. Taxes and fees not included in payment. **On approved credit. Taxes and fees not included in payment.